This piece is being written from Nashville, TN, before I attend a memorial show by Double Trouble commemorating the 20 year anniversary of the passing of Stevie Ray Vaughan. As I write this, Stevie Ray Vaughan's final performance on this earth is playing through my headphones. Buddy Guy is singing "Sweet Home Chicago," and Stevie has just started his first solo. A few choruses ahead, Stevie will play a series of bends that give me goosebumps. It's as if he was ripping a tear in the heavens, preparing for his exit from one life into the next. 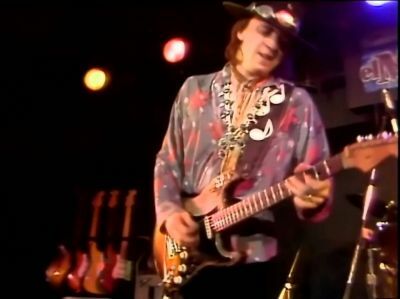 Today Stevie Ray Vaughan's legacy turns 20 years old. I discovered the music of Stevie Ray Vaughan at the age of 18. As I listened to his music blast through the speakers at Clair Brothers Audio, I can still hear myself saying "Now THAT is how I want to play guitar". Later that year, as a freshmen at Penn State University, my roommate played the "From The Cradle" tape by Eric Clapton. Like Peter Parker getting bit by the spider, the sounds on that tape infected me instantly. Nothing was the same after that. For the next few days as I walked to class, in crowds of other students, my fingers twitched erratically. Blues guitar solos echoed in my head and my fingers moved as if they already knew what to do. That same year I saw Stevie Ray Vaughan & Double Trouble on a Saturday Night Live re-run. Hearing him was one thing, but nothing......nothing hit me like the sight of him destroying that stage with his wah pedal and beat-up sunburst strat. Any possibility of giving up the guitar evaporated that day. My emotions had been through the mill before I ever reached college. A massive need for acceptance and validation led me into mostly one-sided relationships that ended before I was ready. These circumstances were amplified by moodiness and occasional bouts of depression. Imagine being mute, unable to speak, but with an overwhelming urge to scream. Nobody has their hand over your mouth, but you're unable to make a sound. Nothing truly allowed me to express what I felt before I discovered the guitar playing of Stevie Ray Vaughan. When I saw him play "Texas Flood" from the El Mocambo show, it was as if my darkest moments were being played out in front of me. There's a section in that performance of where Stevie unknowingly looks with his eyes closed towards the camera, bending desperately on the high E string, like a man lifting a millstone from around his neck, his face reflecting a mixture of pain and relief. Watching that performance cast my motivations for playing guitar in stone. This was not something I did for fun, money, or girls. This was something I did to survive. It was the only thing that opened up a channel for me to express the hurt, anger, and bitterness trapped inside. It is an understatement to say that I was influenced by Stevie's playing. Some people are moved more deeply than others by the same influence. I was moved at a foundational level. It's hard to put into words how deeply his playing affected me. Stevie's playing seemed to rip emotions from such a deep place inside me, that it almost hurt to listen. I remember listened to a live bootleg performance of Texas Flood, when his playing got so heavy that I nearly had to stop walking. It's not as simple as hearing something, liking it, and wanting to learn it. That's what I did with Led Zeppelin or Guns And Roses. No, with Stevie's playing it was much different. Learning his music was more like going to therapy than playing guitar. What I'm trying to say is that although I never met him, or saw Stevie alive, his playing changed the direction of my life. It gave me an outlet that I desperately needed, and provided an efficiency of expression unmatched by anything I've found before or after. Stevie played for keeps. He was the hurricane of blues guitar players, a force of nature, a force beyond comprehension. It's not that he wasn't capable of playing gently, but even when he did, it was like being in the eye of the hurricane for a moment of calm, before the crushing winds knock the breath from your chest. I am my own biggest critic. I hear ever missed note, every sloppy ending, every wrongly timed lick. In fact, my hearing is way, way better than my playing. Years of dissecting extremely fast licks, with no help from slow-down tools, have given me the ability to hear things in Stevie's playing that I suspect most players do not hear. Sure he made mistakes, I've heard bootlegs where he played half a song in the wrong key, and he missed notes occasionally like anyone. Most of the time, he was like a machine. The precision in his playing is mind-numbing. Taking into consideration the physical toll inflicted by playing with his level of intensity for even one song, it is absurdly difficult for someone to play that way for two or three hours without slowing down or getting sloppy. When you get neck-deep into Stevie's playing, you quickly realize that about 80% of his playing is familiar territory, regardless of what song it is. The same core concepts, with some variation. The next 15% requires closer study because it's different enough that you won't be able to play it easily based on the first 80%. But the last 5% is what most people can't hear or see. The finest, most intricate details of his playing are almost invisible to the naked ear. The true integrity of a precious stone is only fully realized when examined by a jeweler. Likewise, certain aspects of Stevie's playing only become visible after you've watched, studied, tried and failed to master them hundreds of times. There are licks that I've only heard Stevie play once. Licks that did not 'fit' with the other 95% of his playing. Not only did he play them perfectly, he fit them into his playing as if he had played them 1000 times before. Stevie's legacy is still captivating guitar players all over the world 20 years after he passed away. Young guitar players all over this world are discovering his music as if it happened yesterday. He didn't write books, pass laws, build orphanages or donate billions to charity. He played guitar and wrote songs. Lots of people do those things. Most of them only impact a few friends and family. Stevie reached millions. The point is this. You don't get to choose how much impact you have on people. But you can choose how little. You can eliminate your impact on anyone else by walking through life with your head down, seeing yourself as tiny in the eyes of other people. Stevie's music may have influenced a lot of people, but there was a life-changing level of influence that he could have withheld by simply keeping his mouth shut. When he got clean, he began speaking out at his concerts, encouraging people to love and take care of each other. Compare that to the shallow, immature, and ultimately dangerous 'advice' so carelessly passed down by successful musicians throughout the last 40 years. He opened up his life to critics and fans alike. The choice to speak out, reveal his struggles, and encourage others, gave him an avenue of influence into the lives of thousands of people with similar demons. There are people who are still alive today because of his words and example. In your life, there will be tremendous pressure to do what is normal, what is safe, and what rocks the boat the least. It is safe to keep to yourself, safe to keep your mouth shut, and safe to assume that no one cares about what you say. But just as Stevie chose to be vulnerable, and to share his story with others, each one of us can have an impact on those around us. Who knows? Your life, your story may be just what someone needs to hear. 20 years ago today, this world lost a man with tremendous talent, and a powerful story. A story that he shared courageously before he left. Don't leave your story untold.